Saturday Studio Time is a new feature I hope appears regularly on this blog. I am fascinated by the rooms where artists, writers, and musicians work; our spaces for creating art can be small or large, indoors or out, but they are intensely personal and private. 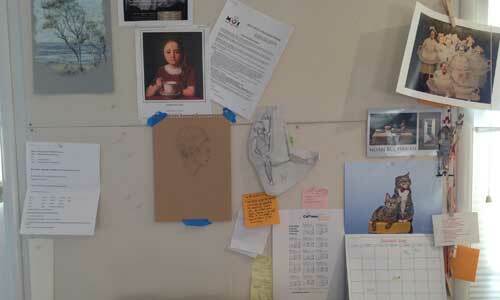 I’m grateful to the artists who agree to share their creative spaces with us for this blog. 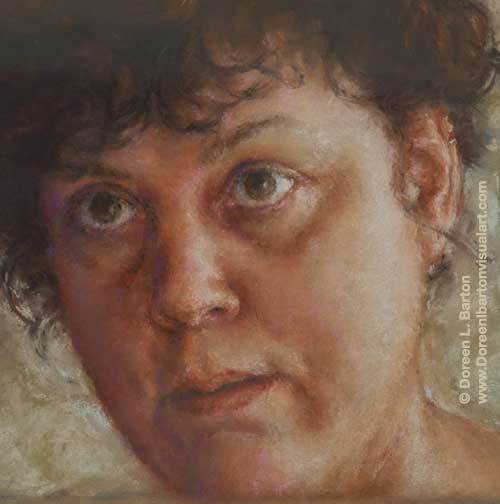 I met Doreen L. Barton when we studied at the Atelier School of Classical Realism in Oakland. Our teacher at the time, Christian Fagerlund, talked a lot about the artist’s mark—the way the artist touches the paper with pencil, chalk, paint. That touch and what it builds is like a piece of the artist’s soul, and gives the work depth, integrity, and substance. Doreen’s marks are so thoughtful, so beautifully sensual and graceful that they infuse her work with deeper meaning than just being pictures on paper. Take some time to visit her website, DoreenLBartonVisualArt.com and you’ll see what I mean. I’m pleased that she agreed to talk about her studio with me. 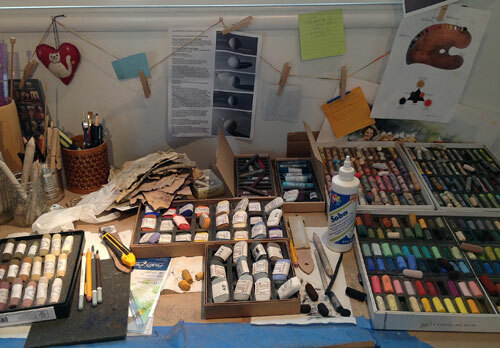 Where is your studio space and what does it look like? My studio is in our converted garage. We added insulated walls, windows and adjustable lighting. It doubles as studio/office space and measures approximately 10′ x 12′. I was lucky in that I was able to plan the space and storage. The walls are a dull white/grey, mat finish. I’d advise anyone to try to adjust reflective surfaces. This is important since the light bouncing off different surfaces (including your walls) in a room will affect how you perceive light values in the subject you’re drawing or painting, even when looking at reference photographs. I also planned the placement of my easel and work surfaces so that I’m able to stand about 12′ plus away from my work on the easel. I have several methods of checking my work. Stepping away and viewing it from at least 10′ is one; at a distance I see the whole piece at once. The first thing I usually see is where the light and shadow values need adjusting. I also see where my measurements are off. If I’m working on a portrait, standing at a distance is for me the best way I can see if the likeness is coming together. How does being in your studio make you feel? There is a certain amount of serenity. I think that putting time and thought into my space has helped me feel committed. I wanted a space where I could get away from outside distractions, so it is an inner sanctum of sorts. I think we experience so many different feelings as we work on our art. It’s important for me to be able to acknowledge my impulses and choices, where ever they may come from. There are many days I am not “in bliss” in my studio; it’s a place where I can push on through the misstep, the conundrum, and try the initially grueling technique or concept again and again. It’s where I decide to take a certain path, set a goal. At times I don’t realize I’m doing so until later. 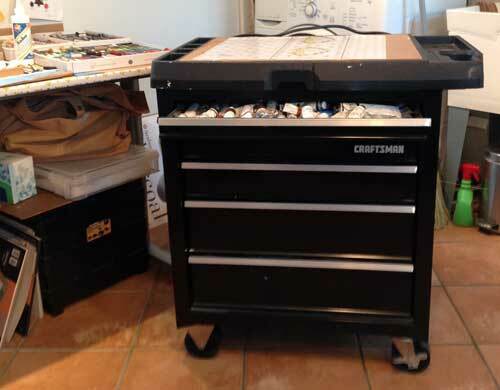 This Craftsman tool chest doubles as storage and a tabouret. 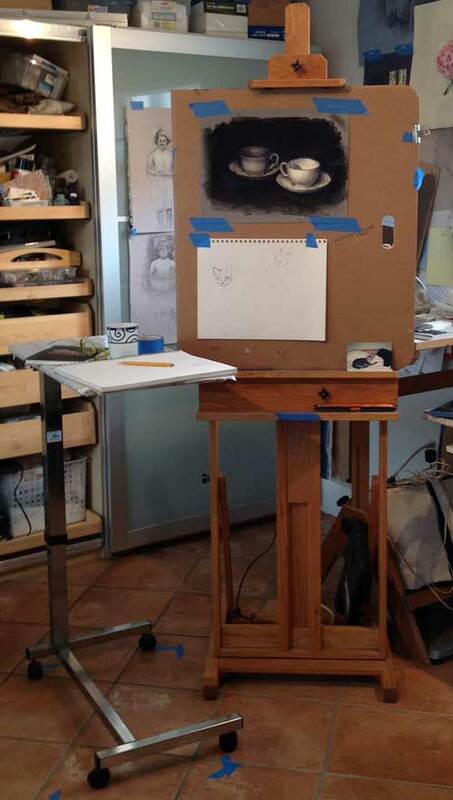 My easel, drawing board, tool chest and table are set up on one side of the room. The majority of my studio furniture and equipment can be collapsed and stored when I’m not using it. I’m organized in that I can find my materials quickly. Keeping up with clutter is another issue altogether. The stuff in my storage shelves spills out like some kind of living organism. Reference materials, class notes, business records and the like are filed. My systems have evolved and I’ve improved at keeping up with them, particularly after I got a business license. Art books, (catalogs and technical reference) are also in the studio. I know some folks keep their art books away from potential spills and splatters. Not me. I want to be able to just grab and search as I need. Homasote bulletin board covered with muslin. I use daylight spectrum lighting, bulbs and track lighting. What’s a favorite piece of furniture in your studio? Some favorite items are my homasote tackboards. These are large, about 3′ x 4′ each. I got them from the local lumber store. I covered them with muslin (I think you could just paint them if you prefer) and mounted them on two walls from about 3′ off the floor to near the ceiling line. I like to be able to pin up images, work-in-progress, references, you name it. I love big post-able areas. A sturdy easel is essential. The table next to the easel is a height adjustable hospital bed-table purchased online. What’s the coolest, most helpful thing in your studio? My easel. It’s the wood frame type. Very solid (doesn’t shimmy or rock), very sturdy and it can hold large boards. I know they’re not cheap, but I they’re worth the investment. I often work with my surface almost directly horizontal to the floor to minimize any tendency to distortion the image as I sketch it out. I love that my easel can hold my work securely in that position or at any angle. It’s very adjustable and steady. Another valuable item for me is a level to use for determining the vertical and horizontal position of the subject. Especially helpful in live model drawing. Give us a studio tip. What one thing you use in your studio helps you to make the art you see in your head? Margaret, thank you to share this so interesting interview!